A little bit of this. A little bit of that. : 2014. Secondly, this is an old image. The tattoo turned 2 years old yesterday. I love it just as much as I loved it 3 years back when I decided it. It means a lot to me. 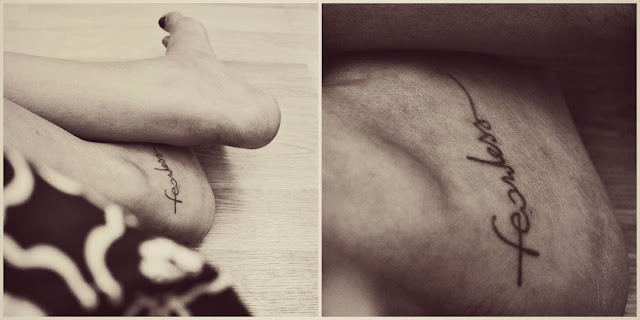 I wanted it on my body so as to remind me everyday that I am fearless. At no point should I lose faith in myself. But as a matter of fact, I did forget that. I don’t remember how long it has been since I had and it's sad how I didn’t even realise it. Today, when I told a friend as to how I am not confident with my writing, I was asked, “You are fearless, aren’t you?” I’m very thankful to him for reminding me about it. Also, I don’t know why I had been dreading (just to some extent) staying at home for new years eve and watching a movie, eating pizza and sipping coke. It was really fun since I was so engrossed in the movie and my good friend was watching it too (at his place)! Also, when midnight struck, I had got a call from my loved one and everyone at home also came and wished me. Everyone close to me was there to wish me, whether physically present or virtually. So I had no reason to be sad. Also pizza can never make anyone sad (unless it shows on your bum and then it will make you sad cuz you know you shouldn’t eat it if you don’t want it to show).